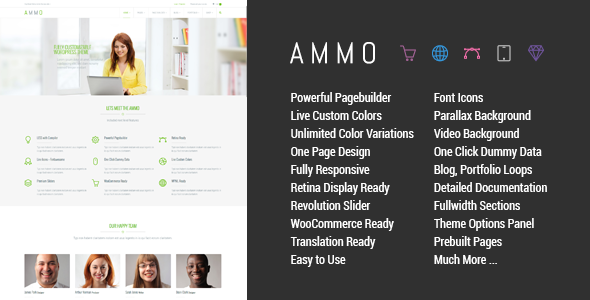 Ammo is a Multipurpose WordPress theme. It is a modern, responsive WordPress theme that builds any type of page design easily with an awesome Page Builder Drag and drop, comes with 33 power elements and 15+ prebuilt layouts and LESS styling. The theme has capacity of all kind of business websites including Corporate, One Page, eCommerce, Parallax, Fullscreen, Shop and Clean design. Item Reviewed: Ammo Corporate Multipurpose WordPress Theme 9 out of 10 based on 10 ratings. 9 user reviews.